Lever-operated lift pump for use in boreholes up to 45 metres deep, with a 4″ diameter and 63mm cylinder. 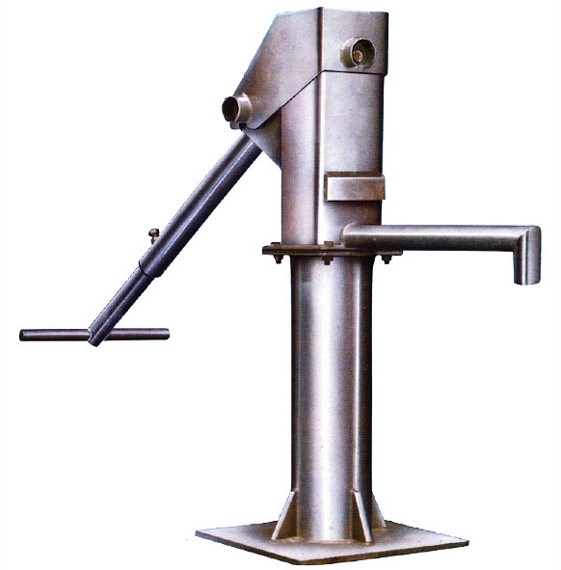 Borehole diameter: minimum 100mm, maximum 150mm. Some manufacturers quote a minimum borehole ID of 110mm. Meets VLOM (village level operated maintenance) requirements. At 30m: capacity 0.4125 litres/stroke, output 1240 litres/hour. Manual installation possible, special lifting gear may be required for depths of over 30m. PVC riser may have to be sourced locally (shipping information below excludes riser), composition list includes riser. Stainless steel pump rods recommended for water with a pH>6.5 or an iron content >1ppm. HAND PUMP, submersible, raw water, Afridev, 4"
10mm Ø x 3m mild steel, galvanized pump rods, forged hook and eye connectors with rubber rod centralizers.